Get a chance to win an ORIGINAL PRINT OF THE CORY PORTRAIT. The mechanics is simple. Log on to your Facebook profile and then visit the DPC Yellow Pages FB page, like it and then tag yourself on your favorite artwork from the Cory Portrait album. Then on the comment box, tell DPC how that artwork captures WHAT IS DEMOCRACY TO YOU. 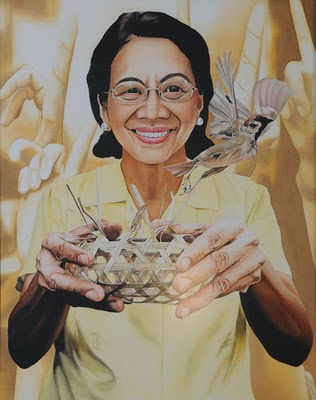 The Grand-Prize winner of the 2009 PLDT-DPC National Visual Art Competition is Julian Eymard D.L. Paguilig from Bulacan State University. Below is the Grand Prize artwork.